The name 'Gorgon' came from a Greek word, 'gorgos,' which meant 'terrible' or 'dreadful'... so you get a feel for what the monster itself was imagined to be like. The earliest known scuplture of a gorgon is on the Temple of Artemis in Corfu, Greece, which was built around 580 BC. The sculpture is worn and incomplete now, but when compared to images of gorgons painted on ancient pottery, the full idea of the monster's appearance can be seen. These early gorgon illustrations show a roughly human form, but have a round face with huge staring eyes, tusks like a boar and a long tongue protruding from their mouths, feathered wings, and snakes in their hair; experts also add that they had scaly skin and "brass hands" with claws (though it's hard to see this on the pottery!). There were only three gorgons, sisters, the three of them birthed by the primordial sea gods Phorcys and Ceto (who were siblings, by the way). Their names were Stheno, Euryale, and Medusa, and they lived on an island "beyond the Pillars of Hercules"... which roughly meant somewhere out in the Atlantic Ocean, with no further details given. Stheno and Euryale were immortal, but Medusa was not; and while all three sisters were very beautiful, Medusa's charms were such that she attracted the attention of the sea god Poseidon. The two of them imprudently made love in a temple devoted to the goddess Athena, also known as "Athena Parthenos," or "Athena the Virgin." Athena was not happy with this crude violation of her sacred ground; and though she could not meaningfully punish Poseidon, as he had a godly status greater than hers... she could punish Medusa, and boy did she! It was Athena who transformed Medusa, and her sisters, into the gorgons; and not only were the three sisters rendered hideous in form, they were each cursed with a gaze that would transform any living creature that met their eyes instantly into stone. In a short time, every human, bird, and animal on their island had become lifeless statues, most frozen forever in a horrified pose. Now, stupid though it may sound, the legend of the three deadly sisters led adventurers and heroes to seek them out to battle. Naturally, none of these brave men survived their encounters with the gorgons which, ironically, led to more 'heroes' heading to the island... all of which must have sucked for poor Stheno, Euryale, and Medusa. One of the adventurers was a youth named Perseus who had been tricked into promising to behead Medusa by a man who wanted Perseus dead. Luckily for Perseus, Athena was still angry at Medusa; for it Athena that instructed Perseus on where to obtain winged sandles (for flying), a powerful sword, and a helmet that rendered him invisible! He flew to the gorgon's island, and -- using a polished shield to safely gaze at the gorgons -- he snuck around until he caught Medusa sleeping... and some say that Athena herself pointed out which of the three gorgons that was. Things got weird very fast. When Medusa's head was struck from her body, two full fledged monsters sprung from her blood... the winged steed Pegasus, and the giant with a golden sword Chrysaor, the children of Medusa and Poseidon finally born. Apparently not easily distracted, Perseus scooped up Medusa's head into a bag and, between flying shoes and a helmet of invisibility, had no trouble escaping the monstrous woman's enraged sisters. Perseus put Medusa's head to good use; when he returned home, and the man who hoped he would die asked if he had gotten the gorgon's head, Perseus said "Yes"... then pulled it out of the bag to show his enemy, which was probably a bit of a surprise for the poor guy. 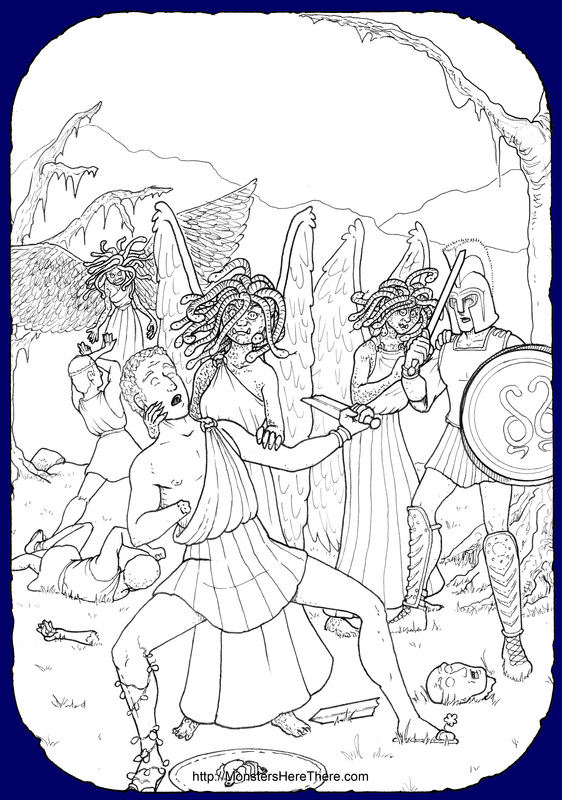 Perseus then gave the head to Athena, who affixed it to a shield meant for use by the ruler of the Greek gods, Zeus. So the moral of this story is: Don't Piss Off Athena. Seriously. This use of Medusa's head as the ultimate shield for Zeus inspired many warriors to have an image of the gorgon's head put on their own shields. The image of Medusa's head was also used as a general sort of good luck charm meant to ward off evil, called a "gorgoneion" -- or "gorgoneia" if you have more than one. These images appeared on buildings, clothes, coins, and dishes... imagine eating dinner from a gorgon's face! Over time, the face of Medusa as presented in the gorgoneia slowly changed from the original monster with tusks, staring eyes, and tongue, to that of a beautiful maiden with snakes for hair; so, in the end, Medusa was able to mostly return to the form that Athena had taken from her in life. It should also be noted that while the mortal gorgon Medusa is dead, her sisters Stheno and Euryale are immortals and possibly still out there... of course, anyone who has run across the gorgons’ island probably isn’t able to tell us where it is! Mythology in Art, by Willis Boughton, 1893 New York, New York, USA. Pgs. 173-176. Online: Click Here! "Stheno & Euryale in Greek Mythology," by Christopher Muscato, page in the Study.Com website, viewed 9-11-2018. Online: Click Here! Apollodorrus: The Library, Volume 1, by Apollodorus, translated by James George Frazier, 1921 London and New York, England and USA. Online: Click Here! Gods and Heroes of the Greeks: The Library of Apollodorus, by Apollodorus, translated by Michael Simpson, 1976 USA. ISBN: 0-87023-206-1. Online: Click Here! Arts and Sciences: Vol. 4, by Charles Knight, 1867 London, England. Online: Click Here! "Temple of Artemis, Corfu," page in the Wikipedia website, viewed 9-10-2018. Online: Click Here! Close up of Gorgon at Temple of Artemis, image in the Wikipedia website, viewed 9-10-2018. Online: Click Here! "Athena," page in the Wikipedia website, viewed 9-11-2018. Online: Click Here! "Perseus," page in the Wikipedia website, viewed 9-11-2018. Online: Click Here!